The unusual name of this upcoming free event may raise some eyebrows. 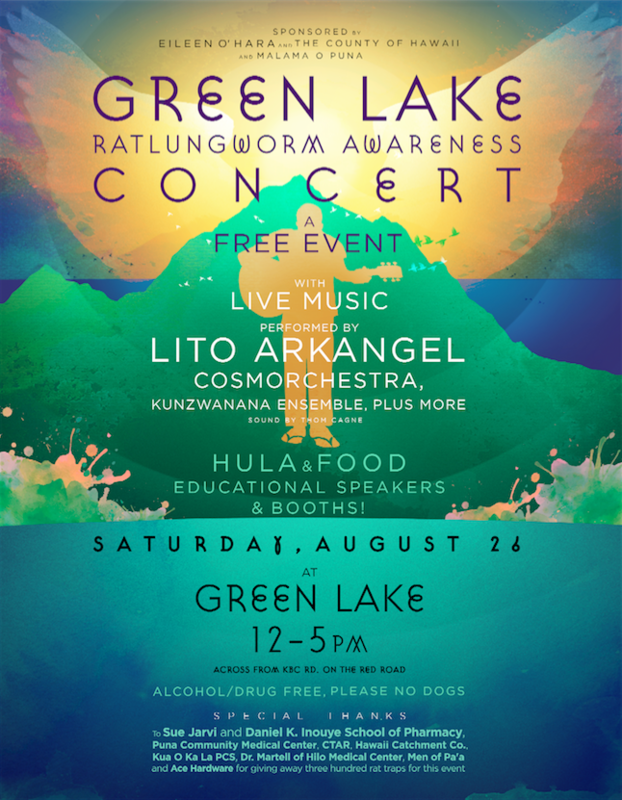 A concert at the beautiful Green Lake/Green Mountain campus is the “tickler” to draw attendance to this educational event, the purpose of which is to control the vectors of Rat Lungworm Disease by providing the affected community with the knowledge and resources to combat it. The entertainment will be headlined by Lito Arkangel, with Cosmorchestra, Kunzwanana Marimba Ensemble, Uncle’s ‘Awa Band, and other performers, including a hula halau, and will run from Noon to 5:00 pm on Saturday, August 26th. The music will be supplemented by short educational speeches, informational exhibits and, of course, food and craft booths. Learn how to keep rats and slugs out of your vegetable garden, how to manage your water catchment system, and how to prepare food safely. Get the latest in research results about the disease, which is prevalent in Puna makai. Rat Lungworm Disease is a form of meningitis that can affect the brain and spinal cord. Symptoms may include severe headache, stiffness of the neck and back, skin tingling, pain and sensitivity to light, hallucinations, nausea, vomiting and sometimes coma and death. In Hawaii it was first documented in lower Puna and is still most prevalent there. The rat lungworm is a parasite with a complex life cycle that alternates between two hosts: rats and certain snails and slugs. Rat lungworm has five larval stages, followed by a reproducing adult stage. Humans are affected by the third stage larvae which come from the snails and slugs. Inside the human body they are unable to grow to full adulthood and complete their life cycle – they generally die in the central nervous system. They infest farms, vegetable gardens and home water catchment systems and enter the human body through ingestion of produce contaminated with their slime, or through unfiltered catchment water. The best defense against Rat Lungworm Disease is proactive – avoidance of the hosts, and the strategies to accomplish this will be shared at the event by the State Department of Health, the School of Pharmacy, CTAHR, Big Island Invasive Species Committee, Hawaii Catchment Company, Malama O Puna, and Puna Community Medical Center. There will be people to talk to at their booths and lots of printed material to take home to read and refer to. Ace Hardware will being giving out a limited number of free rat traps and there will be water catch filters available. There will be slug-eating ducks for sale. The students of Kua O Ka La Charter School will open the event with a Hawaiian chant and blessing. The Burrows family is donating the use of the property, some tents, stage, and some of the security. Men of Pa’a will be providing security and parking attendants as well. Vendors may contact malamaopuna@yahoo.com or smileyburrows@aol.com for information and to arrange for booth space. The event is co-sponsored by a county contingency grant from Eileen O’Hara and the environmental nonprofit Malama O Puna.